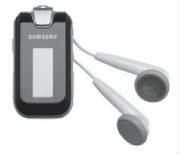 Flash MP3 player: The small, lightweight Samsung YP-F2JXB pendant-style flash memory MP3 player features 512MB of storage. Compatible formats: The YP-F2JXB is compatible with MP3, WMA and OGG playback. Additional features: This MP3 player also includes an integrated FM tuner, voice recorder (with built-in microphone), clock and a 3-line LCD display. USB connection: The built-in lithium-polymer battery recharges through the USB connection to your PC for up to 12 hours of playback. It's compatible with PCs running the Windows operating systems, and it connects via USB 2.0 (which is built into the player).